A New Mexico man sued the Air Force on Thursday, claiming Air Force Academy senior officers and cadets illegally imposed Christianity on others at the school. The suit was filed in federal court by Mikey Weinstein, an academy graduate and outspoken critic of the school's handling of religion. Over the past decade or more, the suit claims, academy leaders have fostered an environment of religious intolerance at the Colorado school, in violation of the First Amendment. Weinstein claims that evangelical Christians at the school have coerced attendance at religious services and prayers at official events, among other things. "It's a shocking disgrace that I had to file this thing," Weinstein told The Associated Press. The Air Force declined immediate comment. Cadets, watchdog groups and a former chaplain at the academy have alleged that religious intolerance is widespread at the school. On Aug. 29, the Air Force issued guidelines discouraging public prayer at official functions and urging commanders to be sensitive about personal expressions of religious faith. There have been complaints at the academy that a Jewish cadet was told the Holocaust was revenge for the death of Jesus and that another Jew was called a Christ killer by a fellow cadet. A banner in the football team's locker room read: "I am a Christian first and last ... I am a member of Team Jesus Christ." Also, there have been complaints that cadets were pressured to attend chapel, that academy staffers put New Testament verses in government e-mail, and that cadets used the e-mail system to encourage others to see the Mel Gibson movie "The Passion of the Christ." Weinstein, who is Jewish and lives in Albuquerque, said the Air Force has violated cadets' right to worship as they choose. "My problem is not with Judaism, Hinduism, Christianity or even evangelical Christianity," he said. "It's that whenever a religion — in this case a group of people — tries to engage the machinery of the state, it is constitutionally repugnant and violative." 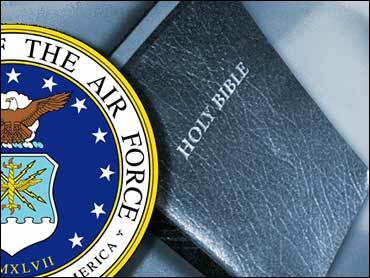 The lawsuit, which names the Air Force and its acting secretary, Pete Geren, as defendants, asks the Air Force to prohibit its members — including chaplains — from evangelizing and proselytizing or in any related way attempting "to involuntarily convert, pressure, exhort or persuade a fellow member of the USAF to accept their own religious beliefs while on duty." In June, an Air Force task force said it found no overt religious discrimination but observed a lack of sensitivity among some and confusion over what is permissible in sharing one's faith. After a July visit to the academy, a team from the Yale Divinity School issued a report last month saying it found lingering problems among the academy's chaplains, whose activities may conflict with the goals of school leaders and the Air Force overall.